If you are living in the 21st century, then there is no doubt you own a smartphone. Now, if you already have a smartphone, have you ever thought about making few bucks out of it? Well yeah, it really is possible to make money with smartphone, and no it’s not a legend, it’s true, just as true as you being human, and you being in need of money. So yeah let’s talk about making money with your smartphone. 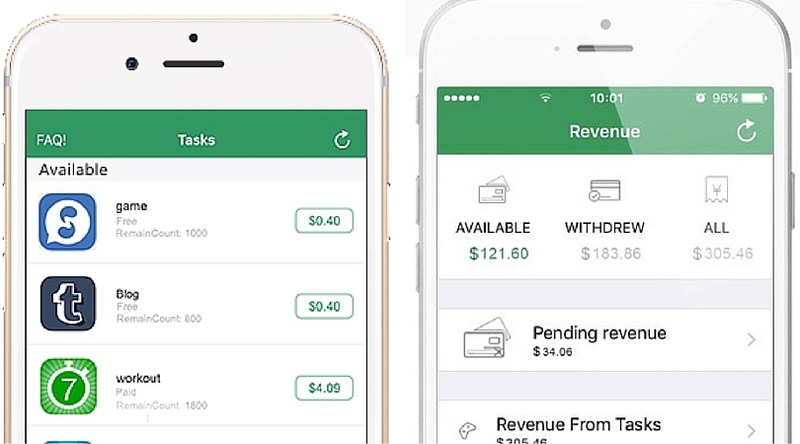 Easy shift is a great iOS application, and it pays you for shifts. Now, what does shifts mean? Well is just some basic stuff like checking if a product is in stock, if the price of the product is alright, or maybe just taking the picture of the product is a store. Add you get paid real money through PayPal in less than 48 hours from the application so yeah I think it’s a pretty good way to make money with smartphone. So it’s kind of easy money actually. TryMyApps offers people the best and most efficient opportunity to make money with smartphone. Well as the name almost suggests, it’s the kind of app which pays you for downloading and trying out other apps. Ever wondered? That you might be paid just to check the Streets, or get paid just by verifying the street signs. Its not a fairy tale comics this is exactly what offers you, all you have to do is when you’re leaving for work, start the app and verify the road in street signs on your way to office and well yeah you look pretty good for the app. No, I am not saying it will make you a millionaire even if you do this forever, but still they pay around dollar three per task so let’s say you will be getting around $10 in your pocket extra everyday. Gympact is probably one of the best and most innovative apps I have ever seen. It’s an app that lets you work out, or another words you can say that you get paid for working out in the gym. You have to set daily goals of your workout and if you do complete them you get paid around dollar 0.40/workout. And the best part is you can cash out as little as $5 out of it and you get paid in your PayPal. Well, the only catch here is if you don’t work out a certain day you have to pay an amount that has been per-determined as a kind of punishment for not working out but well that kind of work that keeps you in shape and gives you a reason to work out and not make excuses. Rocket page you to unlock your iPhone home screen. (Wait, What?!) Yes, I am not kidding, Locket is a kind of application which we download and in return its places ads on your home screen, and you get paid every time you unlock the home screen. You don’t need to click on the ads in order to get paid that’s the best part about it because you can just swipe the screen in any other direction to go to your actual home screens and the adds will be hidden. After having a brief understanding about how to make money with your smartphone by using the apps we listed above, you can know that we can easily make money with our smartphone in our spare time. All the apps are recommended for you. As for me, the best one is TryMyApps, because with it you can make money by trying apps. Besides, it also allows you to get paid apps for free. To learn more about this best money making app, visit this page.